The Road to Langmusi… High up in the Amdo area of the Tibetan Plateau is the small scenic town of Langmusi. Located in the north-east tip of Sichuan Province, Langmusi straddles the border with neighboring Gansu Province. 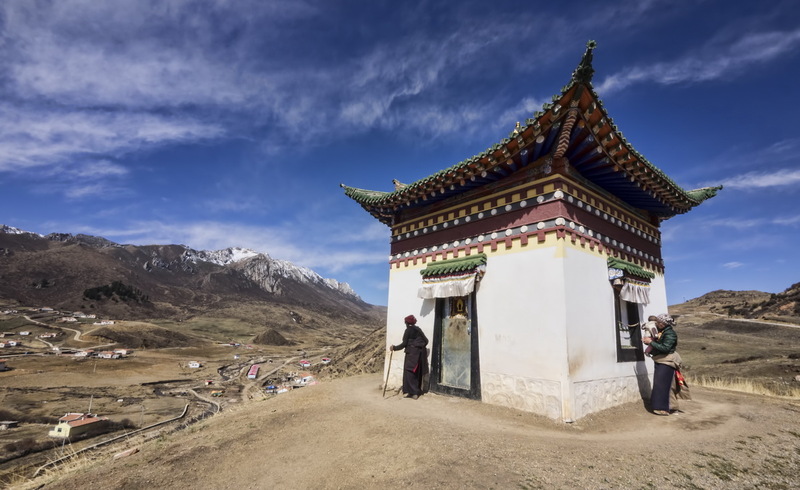 Langmusi is known principally for its two Buddhist monasteries but it also has a small Muslim population and a mosque. Our journey there took us from Chengdu the capital of Sichuan, via the town of Wenchuan – the epicenter of the 2008 Sichuan Earthquake. And then on to the Waqie Pagodas near the rather non-descript town of Hong Yuan. Before arriving at Tangke, where China’s second longest river (after the Yangtze…), the Yellow River goes through a series of bends as it turns northwards. From the First Bend of the Yellow River we headed north for the flat plains of the Ruoergai Grasslands. A journey that took us through some really interesting but quite rugged and isolated country. It’s a full days drive from Hong Yuan to the northern end of the Ruoergai Grasslands. So we decided to break our journey with an overnight stay at the equally non-descript town of Zoige. 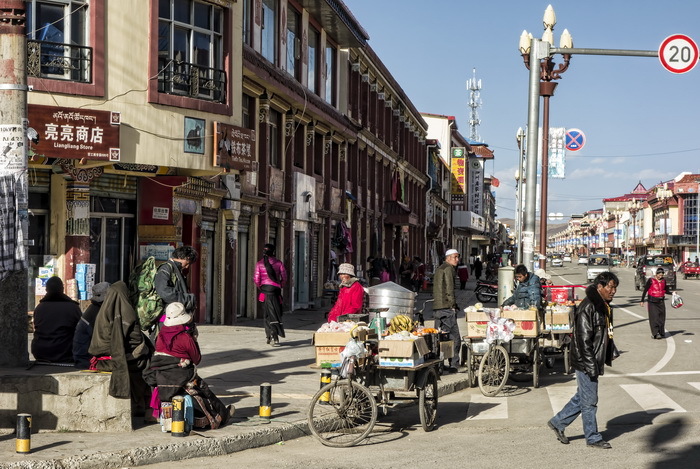 Very little to note about Zoige… Apart from its quite common polyglot mixture of the ethnic people of the area – in this case Amdo Tibetans. And the Han Chinese who have typically migrated there for economic gain. There are two schools of thought about this migration of Han Chinese. With the more sinister being that it is a formal (if unspoken) policy of the Chinese government. As it seeks to dilute and control the ethnic minorities and in particularly the restive Tibetans. The two monasteries at Langmusi are the Kirti Gompa and the Sertri Gompa. The Kirti Gompa is more commonly known as the Sichuan Monastery because it is on the Sichuan side of the Bailong (White Dragon) River. Which divides the town between the provinces of Gansu and Sichuan. We spent the most time at the smaller, but more photogenic Sertri Gompa – a rather imprecise term that is used mainly by westerners to refer to an assortment of Buddhist religious buildings. 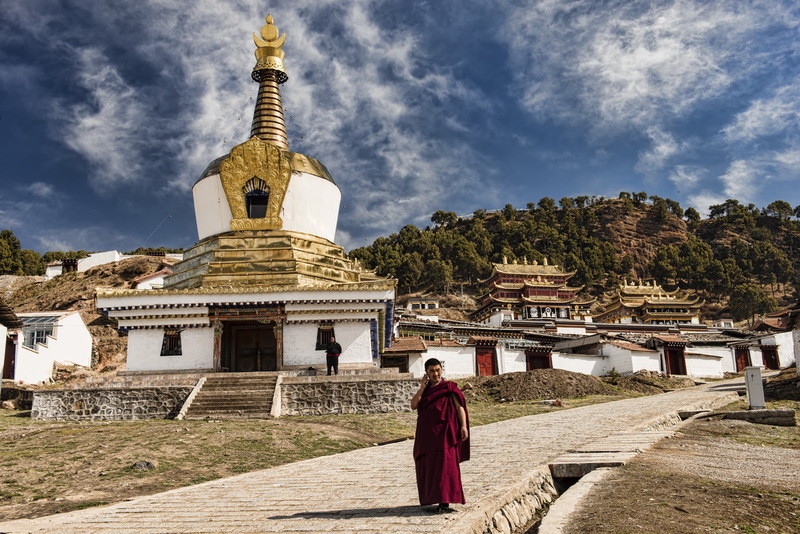 Both monasteries are said to be held in high regard among Tibetans. With the first temples of the Kirti Monastery being built in 1713, while the Sertri Monastery dates back to 1748. Up on the hill overlooking the Sertri Gompa is a small building that is part of the 3km kora pilgrimage track and offers a nice vignette in to the utter devotion that is integral to Buddhism.